Or "The elves and the shoe maker". We went on a shoe mission the last couple of days. Remember the paper shoes from a while back? 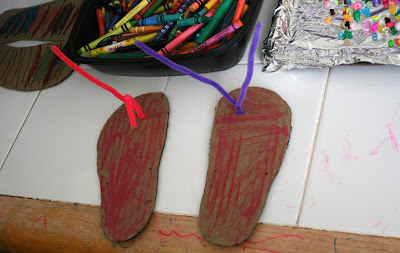 Well, the kids loved that, so I thought we'd investigate a few other ways to make some play shoes. 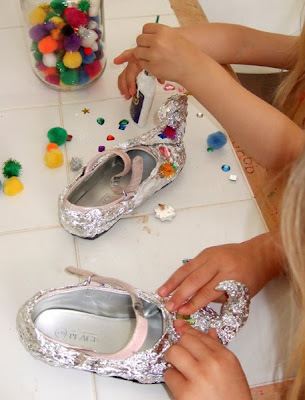 I mentioned wanting to try and squish some tin foil onto a pair of regular shoes to make sparkly genie slipers at the end of my tin foil dress up post last week. We did have a go at that and the kids stuck a load of jewels and pom poms on them. This is how they ended up. Don't worry, the shoes underneath are undamaged. 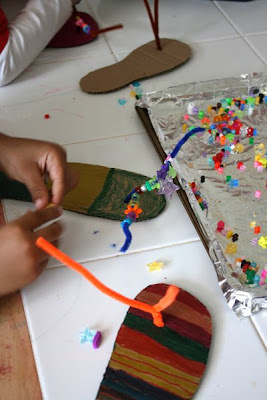 Ages ago I saw a post on Earth and Living about making leather viking shoes for adults and that got me thinking that I'd love to let the kids make some with felt or craft foam, so we tried that too. 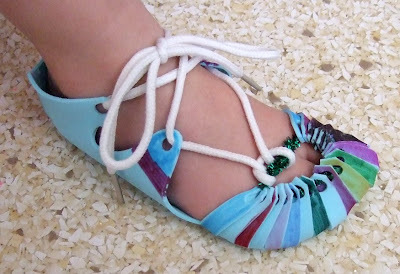 I measured and cut out the pattern from one sheet of blue craft foam (great instructions on how to do this in the tutorial here) and the kids coloured them, then it just took a pipe cleaner to tie all the toe pieces together and a pair of old laces. I glue gunned the heels together. They would be more durable if I'd made them from felt, but I wanted the kids to be able to colour them in. 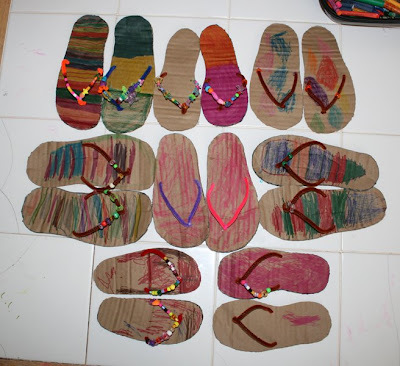 Lastly, I had nine kids over on Tuesday and we made cardboard and pipecleaner flip flops. Now you have to help me out here, because I saw this idea on another blog a little while ago, but I've searched and I can't find where it was now. 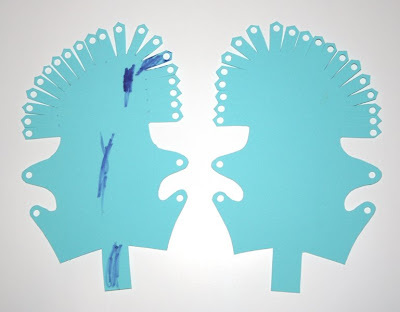 I know it was a mum that did this with two children and it really was exactly what we've done here (cardboard, pipecleaners and beads), so I'd love to link to her and give her credit for what was a totally fun craft for a lot of kids. Anyone know who I'm talking about? 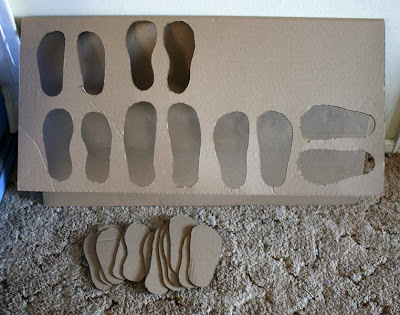 LiEr made some cardboard shoe templates for her kids to practice tying laces with recently, but awesome as that is, it's not the post I'm thinking of. Anyway, I'll update the post when I find the illusive blog link I am referring to. LiEr found the link for me! It's from Ramblings of a Crazy Woman. Here it is! She credits Teaching Two, so go have a look at these two links to see more of this craft! 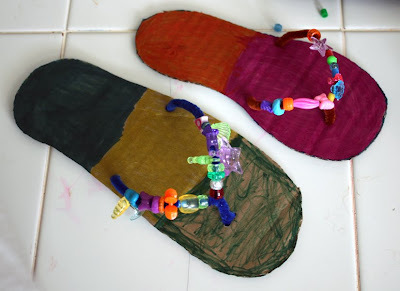 There are also lots of versions of flip flops on the intertoobs made by kids using craft foam for the soles and ribbons as the straps. 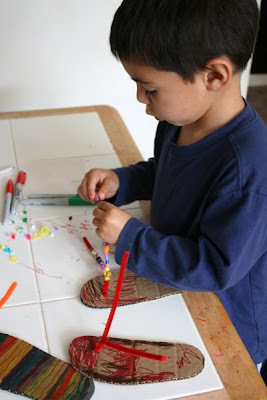 I drew around the kid's shoes and cut the soles out of more pilfered Costco cardboard with my trusty exacto knife. Only six pairs cut out in this pic. We had three more kids arrive and join in later. I labelled the backs of the soles with the kid's names to avoid confusion. 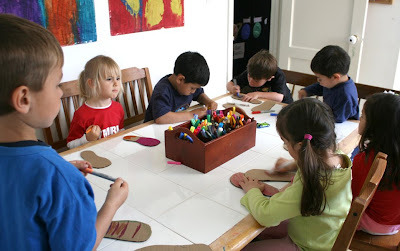 The kids then coloured in their shoe soles with markers and crayons. 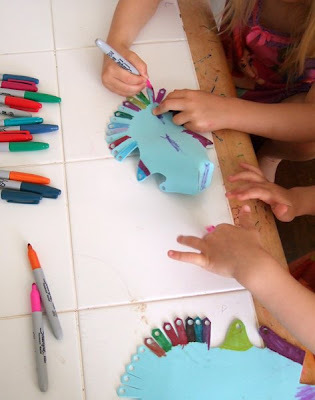 This was a really good project for a lot of preschoolers at once (aged 3 to 5). They were all very proud to have made their own custom shoes to take home. Hi KM, I don't know if my original comment got saved or not because my Bad Computer produced an error message! Grrr. Are these the flipflops you're looking for? I laughed a bit when typing "flipflops" because the insane thing in my head was asking, "JK? RS?" 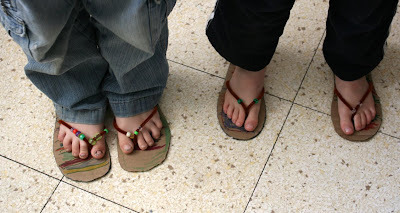 We call them slippers back home in Singapore, and flipflops are those circuitry thingies. 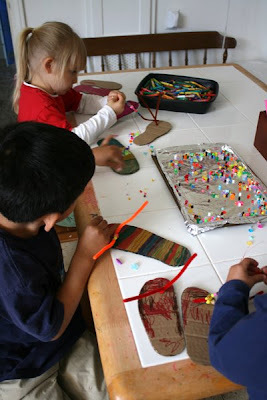 Anyway, in case that first comment didn't get to you, these many shoes you and the kids made are so much fun! 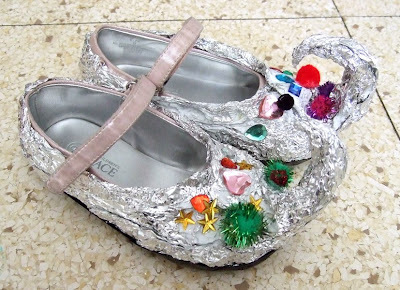 Thanks for linking to me, though my shoes are not anywhere as wearable as these beauties in your post! Awesome LiEr! You are the blog librarian! That was the post I was looking for! I'll update my post with it. Thanks! Thought those shoes and pizza looked familiar! I so love your blog & all your great activities. Thanks for sharing!! I am a very creative spirit and to my ultimate woe my oldest daughter is the epitome of non-creative. Hopefully some of your girl's lovely imagination will rub off on her! So creative!!! I love to encourage children to this way! Congratulations! And thank for sharing! We made these and linked to your site! Thanks!